There were 3 posts published in July 2010 (this is page 1 of 1). 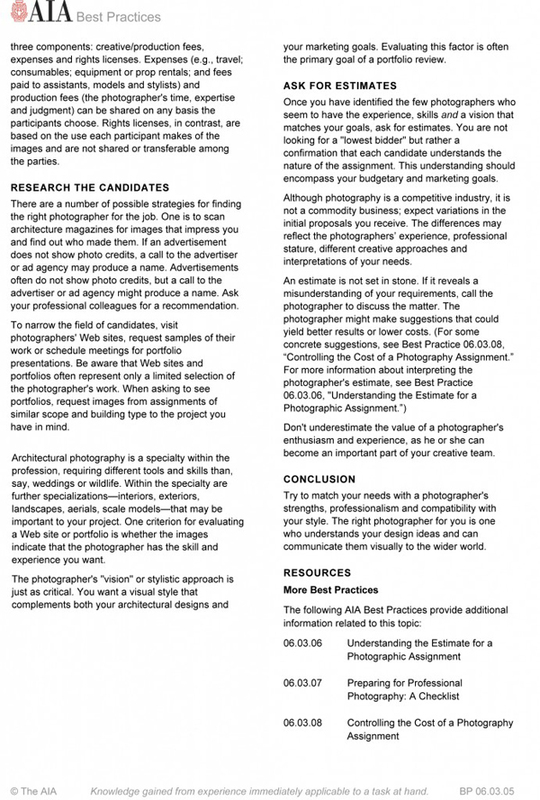 Following my last post about Finding the Right Architectural Photographer, this is another great article by the good ole people at AIA (American Institute of Architects) and ASMP (American Society of Media Photographers) discussing expectations with the professional architectural photographer you choose, covering topics like avoiding un-necessary costs and surprises, as well as giving a helpful checklist in making sure all areas of the photo shoot are covered before the photographer even steps foot on the property. If you are looking to hire a professional architectural photographer, and just don’t know where to start or what to expect, this article is perfect for you! As always, if you have any questions you would like to further discuss with a professional architectural photographer, please don’t hesitate to email at info@paulawattsphoto.com or call at #541-255-5834. How to Find the Right Architectural Photographer for You! Are you looking for a professional architectural photographer, but just don’t know where to start? Or, perhaps, you are using a photographer that specializes in portraits, and you don’t know the difference? If this is you, this article is for YOU! No matter what profession you are in, educating your clients in your field is so important. Not only will they understand where you are coming from in regards to expertise, costs associated, etc, but, they will be able to better realize why they even need your services in the first place. Same goes with photographers. I dare say, even more so with photographers, but then again, I am biased. 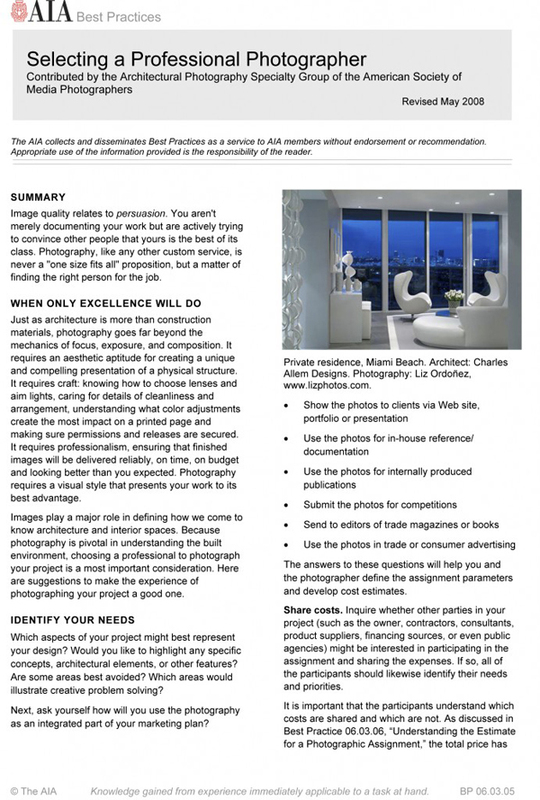 With the help of the AIA (American Institute of Architects) and the ASMP (American Society of Media Photographers), this article helps iron out key points to finding an architectural photographer that not only meets your needs, but with the proper quality and expertise. Wheww… it’s been a while since I’ve blogged. I’m sure everyone has their excuses, but mine is just out of sheer, head spinning, business. The saying “When it rains, it pours” could not explain my business more in this season. I’m not complaining, but instead, feel very blessed for my clients, new and old, who have put their trust in me for their photography needs. A new client, Artisan: Outdoor Living & Landscape, hired me to photograph a home’s landscaping project in the Highlands. Before I met Kevin, owner of Artisan, at the home (residence to remain un-named), I had no idea what to expect – accept that I knew Artisan did beautiful work. I was blown away! 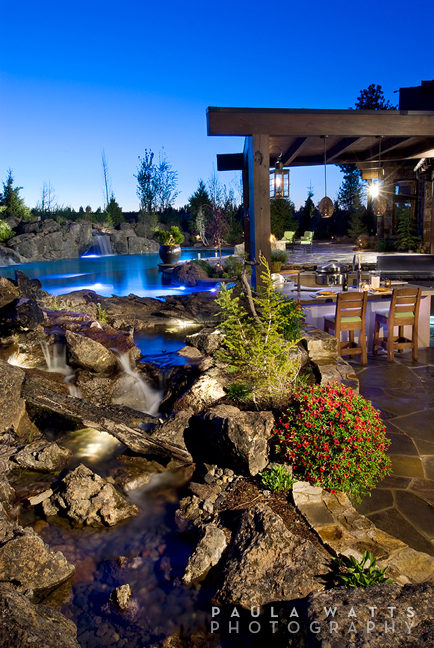 Streams of water flowing around the home, rock formations (made by Artisan), waterfalls spilling into the pool, outdoor kitchen and bar, fire pits, an outdoor pizza oven, the WORKS! It was a photographer’s dream! In order to accomplish the images seen below, the right time of day was crucial. In addition, highlighting certain key elements in the frame with the technical ability of proper lighting went hand in hand with what the sun was doing. 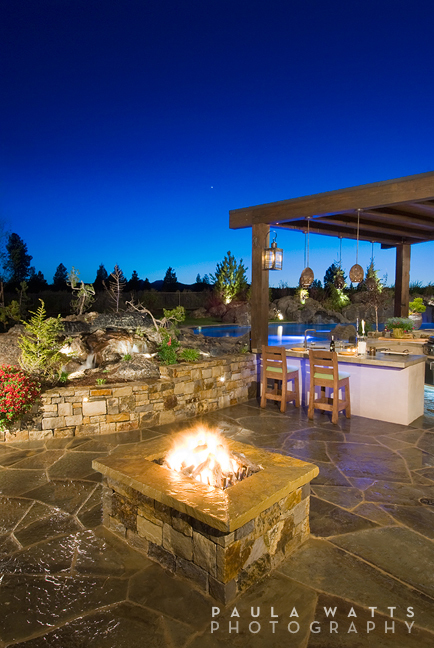 Getting the right feel and mood to showcase this project was also a factor in deciding lighting placement and intensity. All in all, the client was thrilled, which means, I’m thrilled! The recent issue of 1859 Magazine shows the final advertisement, designed beautifully by Dawn Boone Creative, here in Bend Oregon. 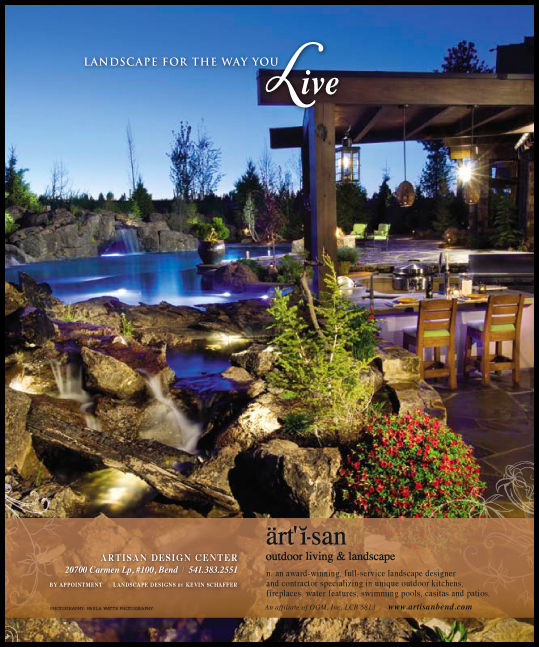 Keep an eye out for more landscaping design by Artisan and images by yours truly.